Are US CEOs overpaid? 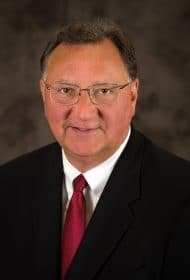 Bob Romanchek, senior partner at the executive compensation consulting firm Meridian Compensation Partners, adds clarity to the issue by looking at the components of pay, the historic levels of total pay opportunity and the critical relationship to company performance. 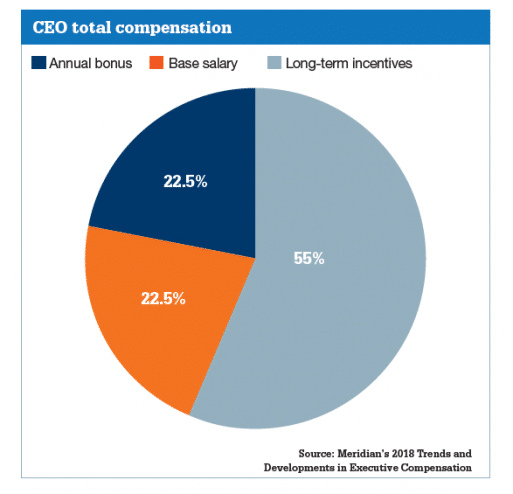 The main components of CEO compensation for large US-based companies are base salary, an annual bonus opportunity and a yearly grant of equity-based long-term incentives, which are typically earned over a three-year period. The cash components (base pay and annual bonus) have increased at a rate of approximately 2–3% annually for the past seven or eight years. However, the long-term incentive (LTI) grant value/opportunity – that is, not the eventual payout value – has increased anywhere from approximately 3–8% annually, depending on the year and the industry. Additionally, if stock price appreciates and/or pre-established performance goals are achieved at above target levels, LTI payouts can be two or three times the size of the initial grant value. Couple this with the fact that LTI grants make up more than a majority of the total annual pay opportunity for CEOs, and it is clear that perceived high pay levels are largely due to the long-term incentive pay component. Large shareholders and proxy advisory firms now apply heavy scrutiny to CEO compensation to test ‘pay-for-performance’ alignment levels, for the purposes of voting each year on the executive compensation ‘Say on Pay’ referendum. 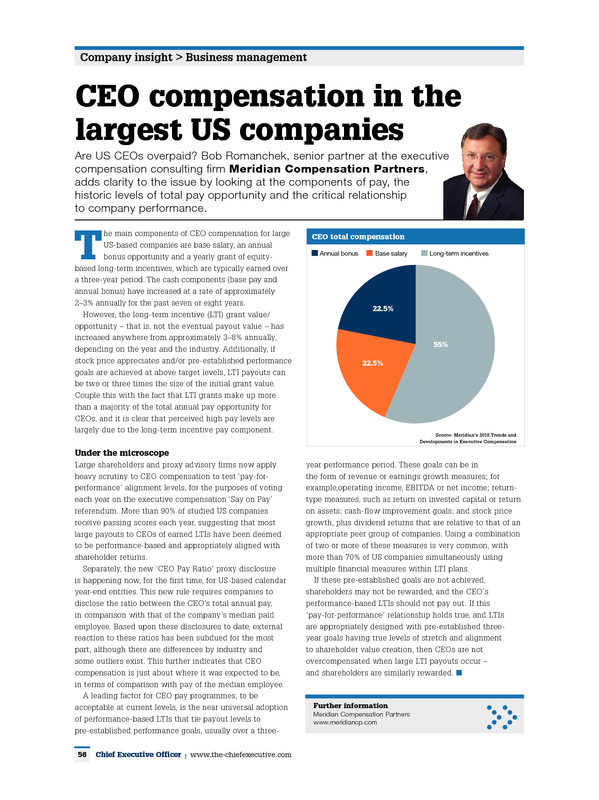 More than 90% of studied US companies receive passing scores each year, suggesting that most large payouts to CEOs of earned LTIs have been deemed to be performance-based and appropriately aligned with shareholder returns. Separately, the new ‘CEO Pay Ratio’ proxy disclosure is happening now, for the first time, for US-based calendar year-end entities. This new rule requires companies to disclose the ratio between the CEO’s total annual pay, in comparison with that of the company’s median paid employee. Based upon these disclosures to date, external reaction to these ratios has been subdued for the most part, although there are differences by industry and some outliers exist. This further indicates that CEO compensation is just about where it was expected to be, in terms of comparison with pay of the median employee. A leading factor for CEO pay programmes, to be acceptable at current levels, is the near universal adoption of performance-based LTIs that tie payout levels to pre-established performance goals, usually over a three-year performance period. These goals can be in the form of revenue or earnings growth measures; for example, operating income, EBITDA or net income; return-type measures, such as return on invested capital or return on assets; cash-flow improvement goals; and stock price growth, plus dividend returns that are relative to that of an appropriate peer group of companies. Using a combination of two or more of these measures is very common, with more than 70% of US companies simultaneously using multiple financial measures within LTI plans. If these pre-established goals are not achieved, shareholders may not be rewarded, and the CEO’s performance-based LTIs should not pay out. If this ‘pay-for performance’ relationship holds true, and LTIs are appropriately designed with pre- established three-year goals having true levels of stretch and alignment to shareholder value creation, then CEOs are not overcompensated when large LTI payouts occur – and shareholders are similarly rewarded.